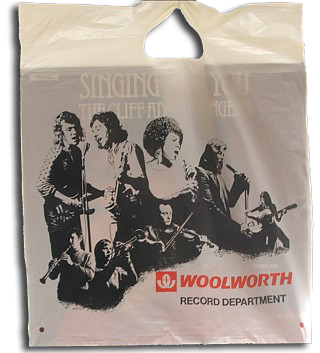 Woolworth built a substantial music business in the 1970s, winning over a new generation of teenagers who knew nothing of its controversial track record with Embassy Records. The Company's buying power and national presence made it an attractive outlet for new compilation record labels looking to break into the market. The albums boasted up to twenty hits on a single disc at an ultra low price, and sold superbly. By watching sales trends closely Record Merchandisers Ltd were able to alert the Buyer to emerging trends, and to respond quickly. So as well as selling more James Last and Carpenters Albums than anyone else, the stores attracted punk rock fans and disco lovers, selling them singles, albums, 8-track stereo cartridges and compilation LPs and tapes. During the 1970s F.W. Woolworth built a substantial music business, switching the emphasis from own label budget records into the mainstream. Over the decade the company established a strong share of the chart singles market and particularly strong sales of compilation albums and cassettes. The firm exploited the skills of Record Merchandisers Ltd., a music wholesaler that had established a niche in helping non-specialists to enter the market. Its reps trained store staff, placed orders and uplifted any surplus stock on regular visits. It helped to shape the offer, measuring the effect of price cuts, and tuning each store's product selection to fill local demand. Particular success was achieved with Irish and Scottish Music and Instrumentals, as well as the mainstream charts and a new branded budget ranges. 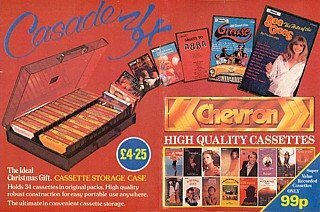 In parallel a Woolworth Buyer built a complementary range of blank tapes, record cases and storage accessories, all at competitive prices. These sold well and helped to keep profits high, despite the lower margins on chart lines. 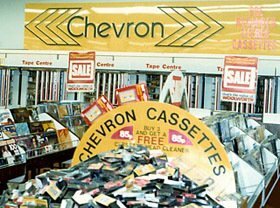 Of all of these ranges, only Chevron was a Woolworth exclusive. Huge quantities were sold, at a price of just 99p when on promotion or £1.25. Some were by the original artists, while others were cover versions by 'Parade of Pops' and were often sold on brightly coloured red or yellow translucent vinyl. The label also carried celebrity albums, like the very popular Henry Cooper Knockout Party, and a strong range of classical by leading British Orchestras like Manchester's Hallé. There are examples of some of the variety on the Chevron label - both good and bad - in our Juke Box Feature. The labels built up a strong following, with some customers collecting all of the titles released by Ronco, K-Tel or Warwick. They were great value, particularly if the variety of artists and tracks appealed. Such was Woolworth's market share that the suppliers agreed to underwrite three-for-two offers at sale time (when lots of old, slower sellers were re-introduced for clearance) and special Christmas discounts which were promoted on television. The suppliers knew that whoever offered the best deal would get the best space in-store and the strongest feature in the commercials. 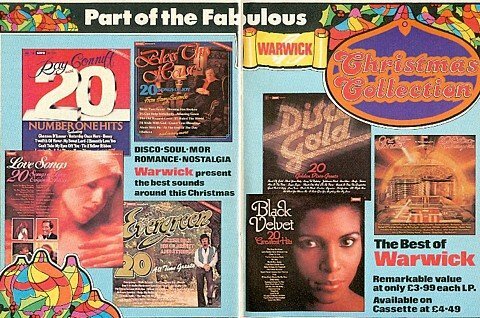 Catalogues and magazines were introduced to promote the music offer. These were jam-packed with supplier advertisements. The suppliers were unfamiliar with the medium, and tended to target their copy to the Store Managers rather than the end-consumer. 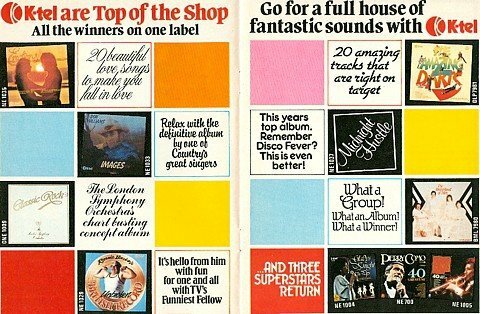 For example K-Tel, which had a superb range and an enviable record of effective TV advertising, headed its feature "Top of the Shop" rather than "the best songs" or "the best value". Despite this the albums sold in very large quanties, making ideal Christmas presents for teenagers and twenty-somethings. Top titles broke the million sales mark in December, as Woolworth rose to become the market-leader for budget albums by 1979. 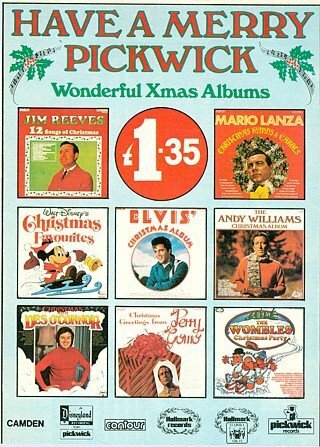 Pickwick built a strong catalogue of all-time favourite artists, licencing the library from RCA and working with Disney to develop soundtracks and sing-along albums. They relied on store signage and bright, modern spin-racks to sell their product with much less money spent on television advertising and marketing. As a result they were able to hold prices to just £1.35 in 1978, undercutting the television advertised titles by more than 50%. Pickwick sruck gold with its RCA licence. The label had secured the rights to Elvis Presley's hits at a time when his career was in the doldrums. Demand rocketed when news broke that the King was dead, with sales boosted by the decision to maintain the price at £1.35 for the duration of the RCA licence. Jim Reeves and Des O'Connor also proved popular with the Woolworth demographic. An Elvis cover, followed by Reeves and a flash of O'Connor were always highlighted from the range in the retailer's break-long Christmas commercials. In 1979, Sir Harry Secombe's booming Aladdin in the wall-to-wall "Everybody Needs Woolworth" campaign, saw a run his Pickwick titles too. 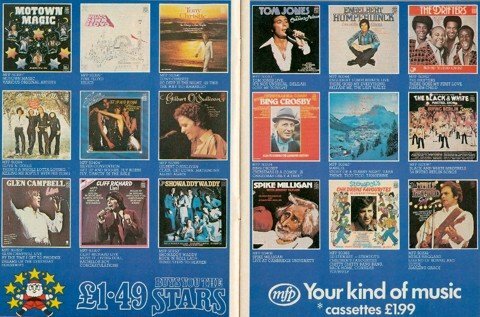 In-store Pickwick's great rival was EMI's budget division, which had a spectacular catalogue of both pop ("Music for Pleasure") and classical ("Classics for Pleasure"). Their list of artists read like a who's who of popular music, boasting everyone from The Beatles to the legendary Tom Jones, along with many kids classics. Store Managers were often amused to see Pickwick representatives 'tidying' their rival's display, code for moving the poor titles to the front and hiding the megastars out of sight. The Managers bit back, alerting the Pickwick Rep. to upcoming, fictitious price promotions by MFP, and thereby securing a price cut on Pickwick for their shoppers! To secure a foothold in-store, reps from Multiple Sounds Distributors, the supplier of Warwick titles, Tempo Storybook Tapes and the exclusive Chevron brand, made up signs on demand, promoting one of a never-ending variety of free offer gimmicks. Store Managers observed that the freebies generated lots of sales. It was a mystery how their simple, round pieces of felt were "anti-static mats", but customers loved them. In August 1979 the simple promotion shown racked up sales of over 1,000 albums in a week in London's Oxford Street. 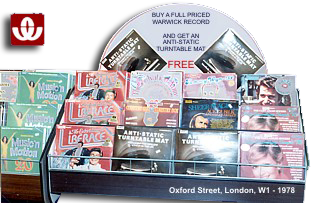 The Warwick Albums were contemporary and sometimes offered a cheap way of buying titles that were still in the British singles chart. Many were themed, for example love songs, number ones or Disco Gold. A similar concept later emerged in a series of more expensive CDs with titles like "The Best Seventies Album in the World Ever" and in budget compilations offered as part of a WorthIt! range of CDs from 2008. The Seventies saw a big expansion of the Music Range. It was was value-led and offered something for everyone. A 20 track album cost 75p to £5. Officianados soon learnt that the cheaper albums had the oldest tracks, one-hit wonders, or were by unknown artists! Click this link to have a listen to a Chevron Cassette or LP track.